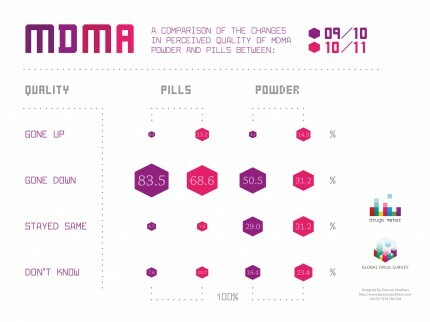 Last years Mixmag’s result’s indicated that the perceived quality of MDMA has gone down. According to the infographic below the quality of pills and powder has improved. According to Dr. John Ramsey, a UK toxicologist “MDMA is back in tablets. Analysis of drugs seized from this year’s music festivals has shown that “ecstasy” tablets are now much more likely to contain MDMA than the strange mixtures of piperazines (BZP, TFMPP, CPP) that have been common for the past couple of years. A sample of about twenty tablets of various designs were analysed and contained 52 – 115mg MDMA (as free base) with the majority around 100mg per tablet. Quite pure crystal MDMA is still commonplace but for the first time we encountered sucrose (sugar) crystals in wraps in amnesty bins presumably to be passed off as MDMA. They are very convincing and require analysis to differentiate the two”.